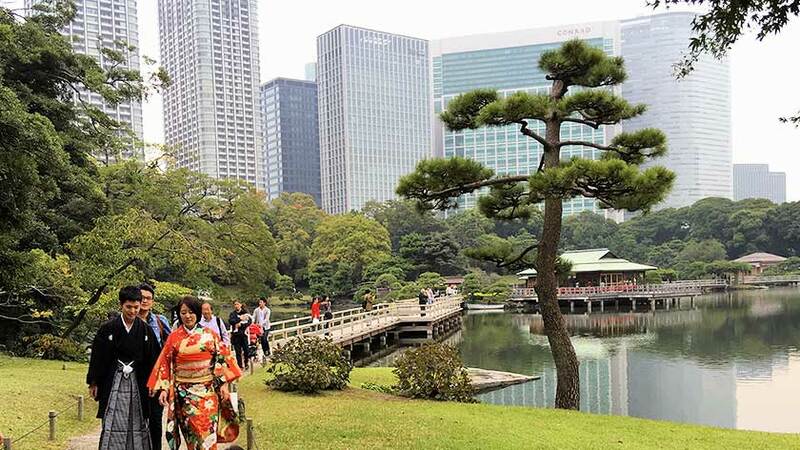 Though Tokyo is known for its bustling streets and crowded trains, there are a number of traditional Japanese gardens in between the skyscrapers to relax and get away from the noise. These are usually the private gardens of former feudal lords and business magnates that later donated their gardens to the city and opened them to the public. Unfortunately, the classical design principals which were used are not very friendly to people with disabilities. Paths are made of dirt, gravel and rocks. Stepping stones lead the paths across streams and ponds, and the designers intend visitors to view the garden from hills or islands. There are also often tea houses which are completely inaccessible. While this is a bit disheartening, most gardens have at least created a “wheelchair route” for people with disabilities to enjoy part of the garden. 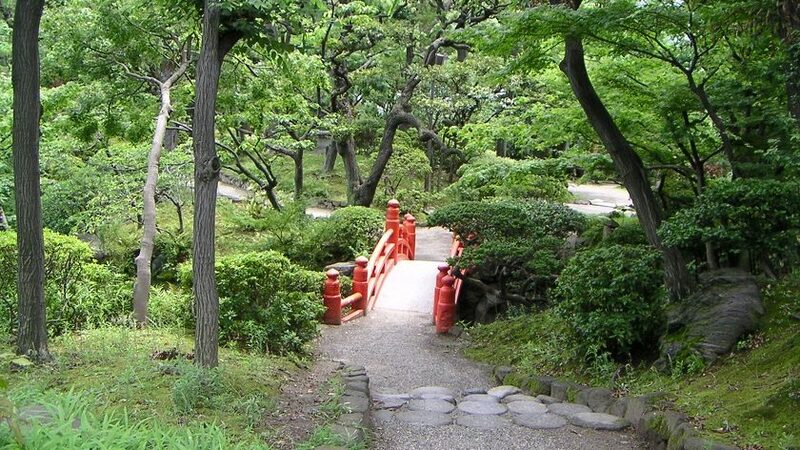 Here are our reviews of some traditional Japanese gardens in Tokyo. The Hama Rikyu Gardens is a public park located at the mouth of the Sumida River on Tokyo Bay. 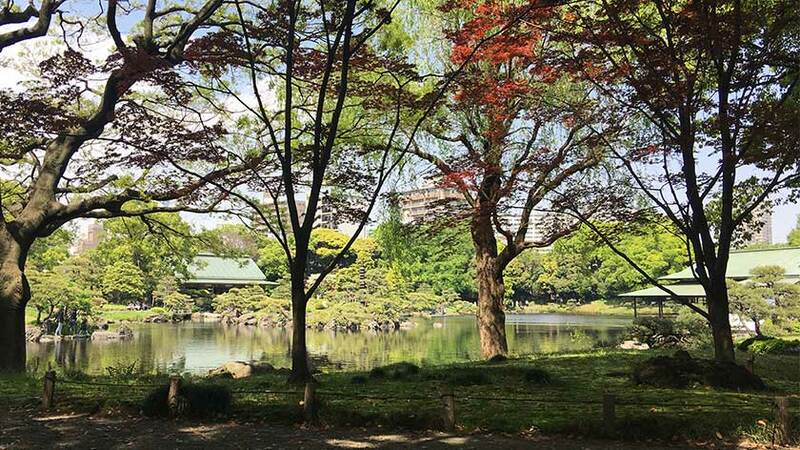 Though nestled amongst the skyscrapers of the Shiodome district, Hama Rikyu Gardens is a quiet oasis where visitors can enjoy nature and tea in a sculpted Japanese garden. While much of the park is accessible, some places – including the tea house – are not accessible by wheelchair. Despite this, the gardens can be a great place to relax and see an historic garden. While the garden is one of the top two scenic gardens in Tokyo, it presents some serious challenges for people with disabilities. If you are in an electric wheelchair or have someone help you over the rough areas and bridges, it is possible to see about 60% of the garden. However, the paths can be difficult in places and nearly all points of interest are inaccessible. While this is disappointing, the places wheelchair users can go still provide some beautiful sights and can be a nice place to enjoy tradition in the big city. While the Kiyosumi Garden is nice, barely half of the garden is wheelchair accessible. 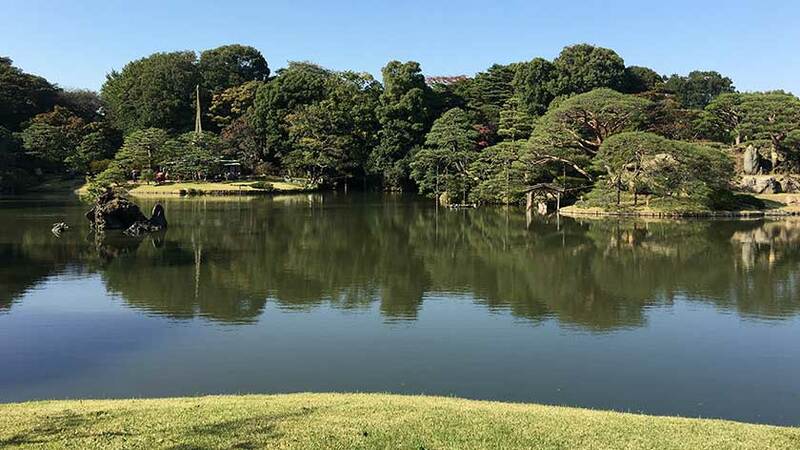 Rikugien Garden and Hama Rikyu Gardens – while they are also not fully accessible – are much larger and allow more access to disabled visitors. This garden is not something you should go out of your way to see. The accessibility isn’t great and it is only so-so as a garden. However, if you have come to the area to visit the Edo-Tokyo Museum and the Sumo Museum, then, might as well take a peek.